"Have you seen the papers today? What can I do to keep you safe? How do I stop these blues? You know that don't you dear? I hope god hears my prayer." One day, standing up for civil liberties will require us to champion talented artists and creative minds, but that day is not today. Joshi and his band sound like they're college kids who recently discovered Guns 'n' Roses and decided to form a band. His lyrics have the complexity of a nursery rhyme, but all this is incidental because the CBFC has turned the spotlight on Joshi by instructing the word "Bombay" be removed from the lyrics of Sorry. 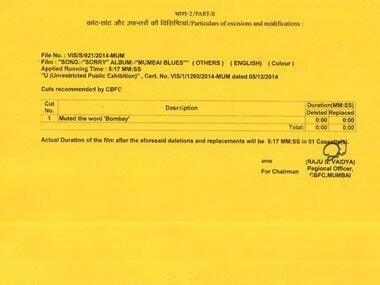 Mumbai Blues, the album that Sorry belongs to, came out in May 2014. The reason the song has become a talking point now is that at the end of last year, Joshi's record label (Times Music) decided to get the CBFC certificate they'd need to show show the song's music video on television. 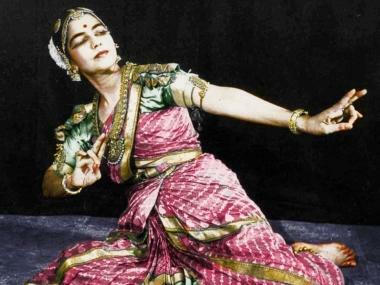 On 5th December, Neelima Naik and Deepak Ramakant Tandel of the song review committee cleared the video on condition that Bombay, mentioned once early in the song, be muted. 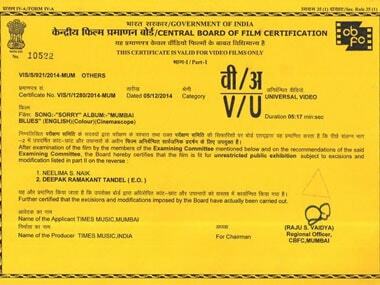 A screen grab of the CBFC certificate. Joshi has made it clear that the only reason he used the word "Bombay" was because it fit his rhyme scheme and he hadn't anticipated anything in the song could be considered objectionable since both song and album have been out for more than six months now. Since Mid-Day reported on Sunday that Bombay had to be beeped out of "Sorry", the swift assumption was made by many that this was the work of the new CBFC board, headed by Pahlaj Nihalani. 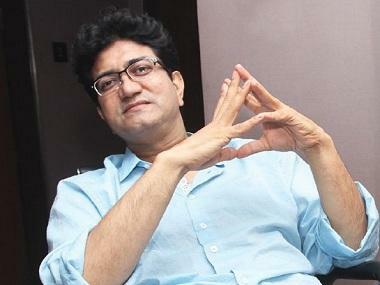 Joshi wasn't sure exactly when "Sorry" had been submitted to the CBFC (understandably, since it's the label that does all this, rather than the artist) and offered an estimate to the reporters who interviewed him. Possibly in a rush to get this outrage-worthy news out, no one waited for Times Music to wake up on Monday and clarify when it had submitted the video for certification and what was in the certificate it received. In the age of the internet, news media are all playing Fastest Finger First, which can, on occasion, have embarrassing consequences. One look at the certificate shows that the "Sorry" case is not the current censor board's handiwork, but that of the previous one. It was cleared by the CBFC committee in charge of songs in December, which was months before the controversy over MSG and the resignations of ex-CBFC chief Leela Samson and other board members. This means there was no ostensible reason to either react defensively or pay obeisance to the right wing. And yet, the CBFC decided it was safer to remove "Bombay" from Joshi's song. 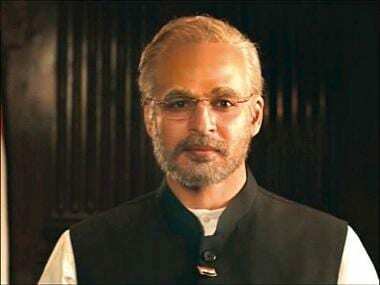 While this is a blow to all those hoping to have drawn first blood against a censor board that's unabashedly political and saffron, there are still enough reasons to feel a chill down your spine. If there's anything more alarming than censorship, it's self-censorship because that is when resistance really is futile. On the face of it, the CBFC's anti-Bombay stance is as silly as the red nose on a clown's face. Bombay hasn't been replaced by Mumbai in a number of institutions, including Bombay High Court for example. Unsurprisingly, social media was quick to point out the absurdity of the CBFC's decision. However, much like the nightmarish quality of clown faces, there's something far more ominous at play in the CBFC's actions than the jokes suggest. The CBFC is not an agency that is free to act upon whims and fancies, political or idiosyncratic. Its actions are governed by The Cinematograph Act, according to which, A film shall not be certified for public exhibition if ... the film or any part of it is against the interests of [the sovereignty and integrity of India] the security of the State, friendly relations with foreign States, public order, decency or morality, or involves defamation or contempt of court or is likely to incite the commission of any offence. Regardless of what you think of Joshi's lyrical prowess, there's no way the word Bombay can be considered against national security or public order. When the CBFC asked for Bombay to be beeped out, it actually has no grounds to do so and in consequence, is violating its own guidelines. The only explanation for the CBFC's decision is that it reacted out of fear. Clearly, the song review committee is haunted by the past actions of groups like Shiv Sena, who once made a regular practice of vandalising cinemas when they screened films that political parties found objectionable. If this is indeed what guided the CBFC's directive to Joshi and Times Music, then it's intensely worrying because ostensibly, CBFC exists to protect liberties, not curtail them. It also questions the credibility of a censor board that doesn't have either the ability or the conviction to be able to tell the possibility of actual offence from their own cowardice. No one can argue that a barely-noticed song in an unstarry debut album could be realistically considered likely to incite the commission of any offence. Two members of the censor board essentially acted over zealously and opted for pre-emptive muzzling. Never mind the wisdom (or lack of it) that guides such decisions, the CBFC's directive offers an indication of the strong undercurrents of fear. Despite knowing that a film named Bombay Talkies came out as recently as 2013 and saw no protests, Bombay as a word was considered objectionable by the censor board in 2014. That's how insecure people feel in contemporary India - even when they are in positions of relative power and belong to the majority. Self-censorship is more dangerous than old-fashioned censorship because it's subtle, sly and often difficult to prove. It arises out of paranoia, which is whimsical and unwarranted by its very nature. In the process, self-censorship could potentially end up stifling a lot more than would be suppressed by someone with an agenda. If people decide to watch what they're saying and pre-emptively muzzle themselves and others not because what's being said is wrong or offensive but because they're afraid, then freedom of expression has already lost the fight.